One of the most popular compact box mods of 2016, the Eleaf iStick Pico has been dramatically improved and can now accommodate larger 25mm tanks. 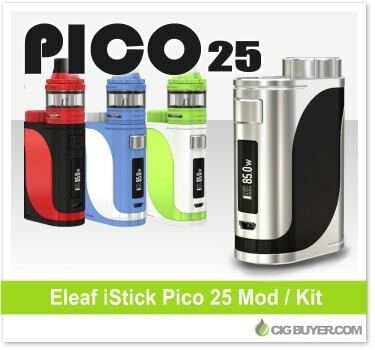 The Eleaf iStick Pico 25 Mod has a new, dual color design with an enlarged OLED display, and the upgraded chipset offers up to 85W of output with a comprehensive temperature control suite (Ni/Ti/SS) with TCR adjustments and preheat. Powered by a single 18650 battery, it retains the same ergonomic shape and rounded edges of the original (48mm x 25mm x 70mm), with an oversized side firing button and discreetly hidden adjustment buttons on the bottom.